Air curtains help promote the perfect environment whether warm, cool or ambient - creating a comfortable climate for customers and employees. Air curtains promote open door trading in retail outlets by providing uninterrupted access for passing trade, and promote significant energy savings. Thermoscreens air curtains are not only easy to install but also easy to maintain throughout their serviceable life. Comes complete with the Ecopower controller. The Thermoscreens C Range is ideal for small to medium sized buildings with moderate pedestrian flow such as retail shops, boutiques, restaurants, and commercial buildings. Master/Slaving of up to 8 units. Rated IP21. 2 year warranty. Air curtains help promote the perfect environment whether warm, cool or ambient - creating a comfortable climate for customers and employees. Air curtains promote open door trading in retail outlets by providing uninterrupted access for passing trade, and promote significant energy savings. Thermoscreens air curtains are not only easy to install but also easy to maintain throughout their serviceable life. The C Range is Thermoscreens most Compact Air Curtain heater. It is very popular in applications where there is minimal headspace above the door. Air velocity and heating output are suitable for sheltered areas. If the door way is exposed to prevailing winds you should consider the Thermoscreens Standard range for light commercial use (T range). 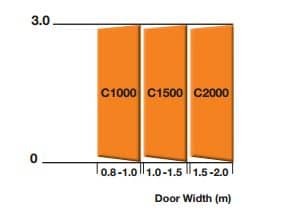 It is important to ensure that the widths wider than the width of the door on which it is to be fitted. Overlapping the full opening, the air curtain controls the ingress of air and other pollutants along the sides of the barrier and so maintains the perfect environment. 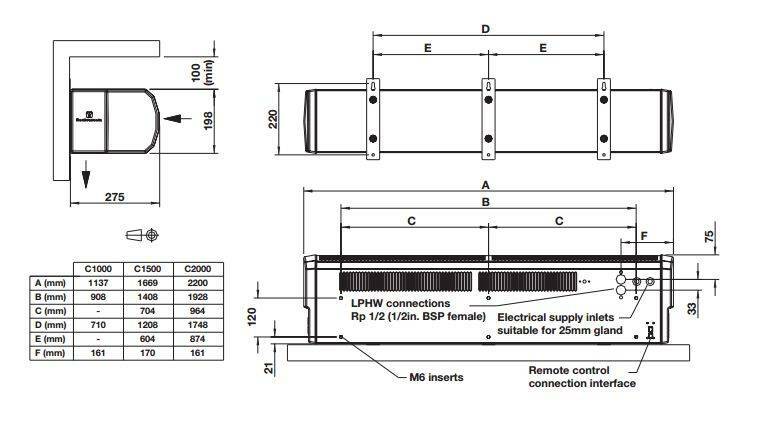 If an air curtain is to operate to maximum effectiveness, it is essential that the air curtain has sufficient air velocity to discharge over the whole height or width of the doorway. Consequently the barrier will act to prevent uncomfortable draughts. As with all of Thermoscreens products, the C-Range is manufactured from high quality components to meet ISO 9001:2000 standards. In addition, all materials used are of low embedded energy, which have a lower impact on the environment, in accordance with ISO 14001:2004 and helping to safeguard the planet. The Ecopower controller is designed to prevent entrance areas over heating whilst also providing all important and measurable energy savings. 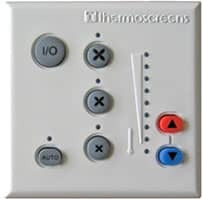 The easy-to-use controller can be set in 'auto mode' to ensure consistent comfort levels are thermostatically maintained. Alternatively, the Ecopower Controller can be manually set for constant 50% or 100% heat output or zero heat output to provide a barrier of ambient air during warmer weather to assist the air conditioning within the environment. Thermoscreens Limited Pioneers of air curtains across Europe, Thermoscreens are market-leading manufacturers of high quality air solutions with an established and well-respected worldwide reputation. Thermoscreens produce a comprehensive range of heated, ambient and cold store air curtains both surface and recessed mounted for any application including retail, commercial, public sector, architectural, industrial and refrigerated environments. Products are exported to over 50 countries worldwide and are backed by a proven brand reputation offering outstanding design, service, quality, reliability and availability. Thermoscreens operate a Quality Management System assessed to BS EN ISO 9001:2000 and an Environmental Management System to BS EN ISO14001:2004. Small to medium entrance with a moderate pedestrian flow.